Have you ever met a polite, smart Tea Party member? Have You Met A Nice Tea Party? 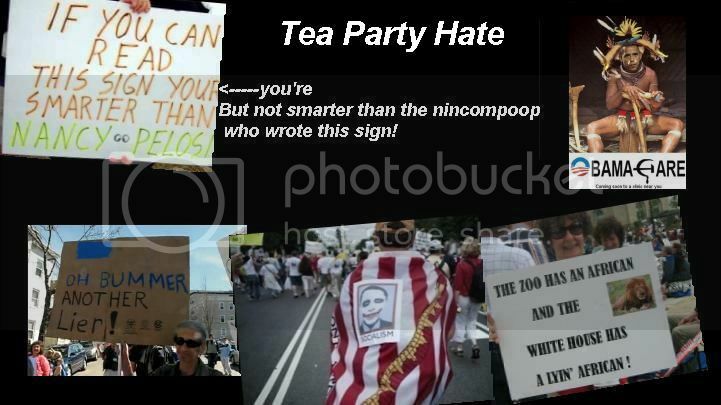 Have You Ever Met A Nice, Polite and Smart Tea Party Member? Neither has Al Sharpton. Watch Politics Nation to see this beyond outrageous, nutty Tea Party woman asking why President Obama hasn't been executed while US Rep. Jim Bridenstine shrugs off questioner and agrees that President Obama is LAWLESS! In a video circulating online, supporters of Oklahoma congressman Jim Bridenstine, called for the 'impeachment' and 'execution' of President Obama in a town hall meeting. "Obama is not president, as far as I'm concerned. He should be executed as an enemy combatant," said an unidentified woman in the video. "I can't tell you, or I can't say because we are in a public place, this guy is a criminal." Bridenstine responded to the woman, stating "everybody knows the lawlessness of this president," however he never said anything about the execution of Obama or agreed with the women on those charges. Bridenstine also did not correct the statements during the meeting. "The only way I see out of this is to overwhelmingly change the senate, so that we can then impeach the SOB," said another unidentified woman. "You know, you look so sweet..." said Bridenstine to the woman.